“That meat is perfection” – My Thirst Mate favoured my own dish to hers, but we were both very happy with our food at La Figa. I’d finished work late, so it was 9pm before we arrived at the restaurant. It was a Tuesday evening and the place was buzzing. My Thirst Mate immediately identified a dessert she wanted later, so we opened with a basket of garlic pizza to share and checked out the rest of the menu. The garlic pizza was a generous portion and included tomato and herbs; very appetising. There was a large range of other pizzas and pastas available, but we both settled on a meat dish. My Thirst Mate ordered Pollo La Figa, a portion of chicken wrapped up in a parcel of breadcrumbs along with spinach and mozzarella. It was unusual, and evidently exclusive to the restaurant. The elements work well together and even better alongside the sautéed potatoes and salad served with both our meals. My own choice was Filletto di Manzo al Pepe Verde; cooked medium. We always share a bite of each other’s dishes, but despite my Thirst Mate’s spoken enthusiasm for my food, I kept most of it to myself. This dish was very thick cut fillet steak soaked in green pepper sauce. It was one of the pricier items from the specials menu but worth a rare treat. I washed it down with a glass of Montepulciano as recommended by our waitress. It was getting late by the time we ordered our desserts, but these were worth staying for. My Thirst Mate had Tiramisu, and for me, Crème Brûlée. The Tiramisu was light, fluffy and not too rich. My Crème Brûlée, not an easy one to get right, was also well composed. The service was proficient and friendly, seemingly mostly Italian. The restaurant itself was bright and spacious, majoring on red and yellow pastels. Our bill came to £73.65 including two glasses of wine and two soft drinks, but excluding service. This is more than we’d normally spend, but it’s hard to fault the food or the overall experience. La Figa is at The Mosaic Building, off Narrow Street, E14 8DN. Telephone 020 7790 0077. My Thirst Mate and I had heard rumours of good food at Bengal Classic so we felt duty-bound to verify this for our loyal readers. It was a Friday evening. We arrived without a booking, while it was still quiet. We noted the attractive decor around us. A large tiger (surely of the Bengal variety) stared down from the ceiling. I enjoyed the Indian string music played softly in the background throughout the evening. After taking our order of poppadoms and drinks our waiter left us with the extensive menu. We are big fans of Indian/Bengali food, so it didn’t take long to find something suitable. To start, my Thirst Mate ordered aloo chat (potato-based) and I ordered chatpotti (chickpeas and hard-boiled egg). They were both served in a tasty tomato-based sauce and whet the appetite for the rest of the meal. 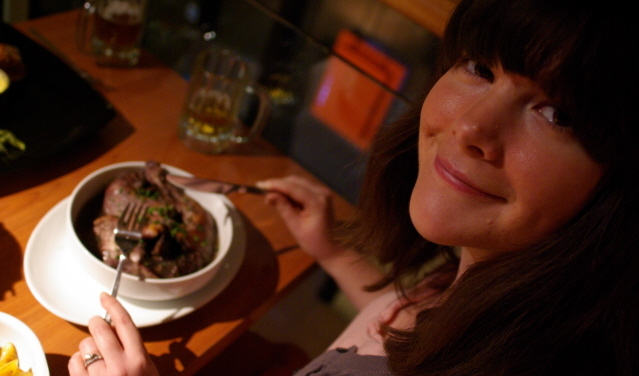 My Thirst Mate’s choice of main course was lamb korahi, a medium-spiced dish with capsicum, served in an iron wok. The meat was nicely cooked and the sauce was thick and satisfying. My order was described as a Bangladeshi speciality, particularly popular in the relatively wealthy city of Sylhet. Murgh (chicken) Jaflongi could be popular anywhere. The sauce contained shatkora, a local citrus fruit bringing an element of sourness to the feast. To accompany the dishes, we had pilau rice, an excellent special rice and peshwari naan. It should be no surprise the peshwari was sweet, but we noticed all our dishes carried an edge of sweetness. So my Jaflongi was both sweet and sour (but very tasty) and even the rice was a little sweet. The meal certainly measured up to our high expectations. What marred the experience a little was that a few young people were in and out like yo-yos chatting to mates dining in the restaurant. Perhaps being sat next to the door made this all the more noticeable. The experience was otherwise a good one and a restaurant we would recommend. The service was welcoming and attentive and the venue was certainly popular. Our bill came to £34.25 excluding service. Bengal Classic is at 11 Pennyfields, just 2 minutes away from Westferry DLR, E14 8HP. Telephone 020 7517 9955. It was a beautiful Tuesday afternoon and my Thirst Mate and I were out for an early lunch. I’m sure the weather explains it, but Mono London was already packed at 12.15. There were a few tables exposed to the sunshine at the front, on the north side of Roman Road. There is also a small basement area in addition to the tables gathered around the food counter. Mono London serves a range of sandwiches, soups and cakes along with drinks including coffee, tea, milkshakes and fruit smoothies. My Thirst Mate ordered a strawberry frappe milkshake and I had a mango and orange smoothie. Both drinks were perhaps a little thinner than a typical milkshake or smoothie, but they were fresh, delicious and just what we were looking for. We both ordered sandwich baguettes for lunch. My Thirst Mate’s was chicken, bacon and sweetcorn. Like mine, it was presented in a basket and seemed to go down well. I ordered a meatball and cheese baguette which the server offered to heat for me. This too went down well. The meatballs were covered with an Italian tomato sauce, into which the cheese had started to melt. It was just what I wanted to accompany my healthy smoothie. We had just enough time after lunch to treat ourselves to a chocolate brownie, for me, and a Danish pastry for my Thirst Mate. Mono London is clean and bright, with a striking black/red/silver décor. The service was friendly and welcoming, which also helps to explain why it was so busy on the afternoon of our visit. Our lunch bill came to £14.70, but it’s certainly possible to put away a decent lunch here, including a drink, for less than a fiver. Mono London is just off the number 8 bus route at 535 Roman Road, E3. My Thirst Mate and I were both on a day off so we set off for the business lunch at Elephant Royale. At £9.80 for three courses, it demanded an evaluation. The restaurant is built into a residential block by the Thames, facing Greenwich across the water. The weather was warm and clear, with the sun shining through the south facing windows brightening up the whole restaurant. The décor is plush and attractive with dark woods, lots of greenery and a water-feature. There is a good view of the busy kitchen near the entrance. We took a table by the window to enjoy the view and soak up a few spring rays. We both ordered dry white wine which was brought to us in mini-carafes. On request, a jug of tap water was also provided. The business lunch is available in both vegetarian and meat selections. Both menus offer a reasonable choice. To start, my Thirst Mate ordered spring rolls and satay chicken from a selection of appetisers. They were well presented and tasted good. I chose seafood soup which included calamari and mussels. It was quite sour, but very tasty. My Thirst Mate has a penchant for green Thai curry, so she treated herself to this along with steamed rice. I managed to secure a micro-portion from her, in exchange for some of my Drunken Duck and Pad Thai noodles. The curry was lovely, with rather tender chicken. I especially enjoyed my own vegetables, which were cooked to perfection. The drunken sauce was very sweet and both dishes went down a treat. We were pleased to see the dessert dishes were quite small, just enough to cap off a satisfying meal. My Thirst Mate chose coconut flan and I ordered Jasmine cake, both of which came with a small dollop of cream sprinkled with ‘hundreds and thousands’. My Thirst Mate and I are both fans of Thai food. We were especially happy with Elephant Royale. 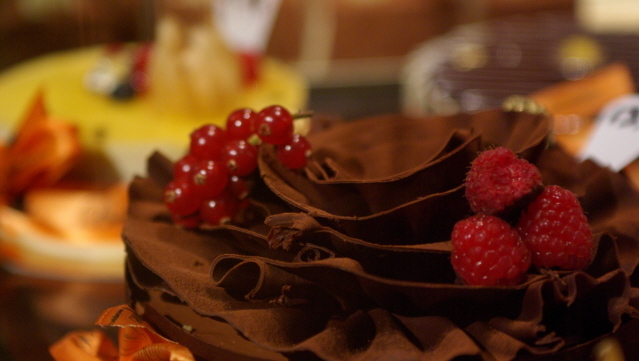 The food was excellent, and the venue itself is attractive and well-sited. Our bill came to £31 including service. Take aways and deliveries are also catered for. Elephant Royale is at Locke’s Wharf, off Westferry Road on the Isle of Dogs, E14 3WA. Telephone 020 7987 7999. My Thirst Mate and I wanted a treat. So we set off for some Italian comfort food at La Forchetta. It was 7.30 when we arrived and there were four tables already occupied. On a Sunday evening, we read this as a good omen. La Forchetta is a large restaurant, stretching way back from the modest frontage. The décor is dated, but uncannily authentic. A wooden boat in Italian colours, suspended from the ceiling, seems simply to ‘belong’. We were given a choice of tables among the other diners near the bar. A dish of complementary olives was brought to our table, along with the menus. On offer was a veritable multitude of dishes: pizzas, pastas and a range of mains. I was overwhelmed. We ordered drinks: tap water for us both, lemonade for my Thirst Mate and a palatable house red for me. Then we settled down to choose our food. My Thirst Mate ordered some crostone, similar to bruschetta but topped with anchovies, tomato and rocket. My bresaola came with sliced parmesan cheese, plenty of meat and a mountain of rocket so impressive I doubted my capacity to eat it. Both dishes were beautifully presented. And I eventually managed to devour the rocket. For our main course, my Thirst Mate chose a chicken and asparagus risotto. It was generously portioned and she was pleased with the aparagus, cooked to perfection. I opted for the saltimbocca alla romano. This was essentially veal wrapped in parma ham and accompanied with winter vegetables and new potatoes. My only complaint was that the vegetables seemed a little overcooked, but the rest was excellent. We ordered a single tiramisu with two spoons and enjoyed it thoroughly. Like the rest of our food, it was generously served, so at this stage we were more than happy to share! The Italian waitresses were friendly and helpful and as the restaurant packed out we noted Italian voices from three neighbouring tables. Such an endorsement was no surprise to us as we enjoyed our meal so much. Our bill came to £46, including service. Lunch deals are available for as little as £6.90 per person. 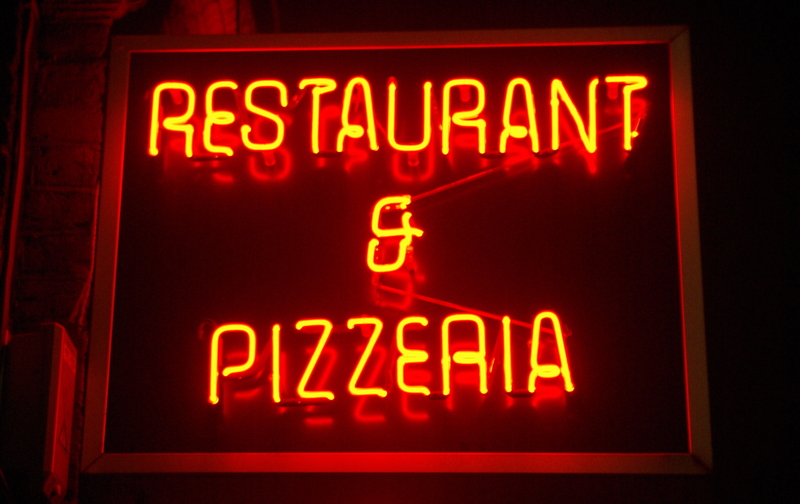 La Forchetta is two minutes away from the tube station at 464 Bethnal Green Road E2 0EA. Telephone 020 7739 9467. Byron is a US-style burger diner at the heart of Canary Wharf but tucked away on the second floor of the Cabot Place shopping centre. There were few passers-by, but among them, as my Thirst Mate and I settled down for lunch, were model Danielle Lloyd and her footballer fiancé Jamie O’Hara along with their four month old baby, Archie. Escalators take you straight to the door. But there is no door. All the waiters in Byron were sporting moustaches in honour of Movember, fundraising for the Prostate Cancer Charity. The diner even offered a special Movember burger with some proceeds going to charity. My Thirst Mate ordered this along with some fries and I asked for the Byron burger with a side order of macaroni cheese. There is a modest range of attractive burgers, which forms the core of the menu. 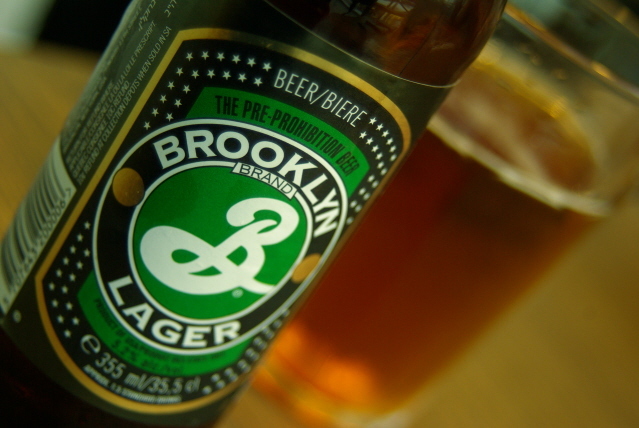 To wash them down, we ordered a strawberry milkshake and a Brooklyn beer, supporting the carefully cultivated American theme. By the time we finished our burgers and carb-laden side dishes, we realised there was no space for dessert, but would have happily ordered anything from the menu of cheesecake, knickerbocker glory, chocolate brownie and flavoured ice creams. The service was friendly and the atmosphere relaxed but busy, as we would expect given the location at lunchtime on a weekday. Our bill came to £31.40, excluding service. 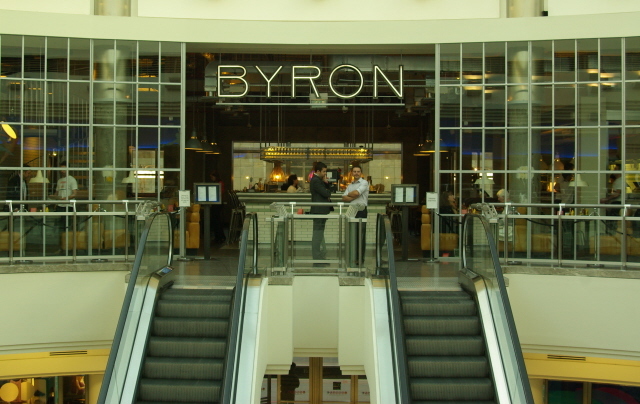 Byron is on the second floor at Cabot Place East in Canary Wharf E14 4QT. Telephone 020 7715 9360.